The Edison Electrical Institute (EEI), an 80-year-old organization of U.S. shareholder-owned electric companies, announced its finalists for its 2013 Edison Award this week. With leadership, innovation, and progress as the criteria, let's take a look at their top two publicly traded picks to see if there might be growth opportunities in this dividend stock sector. AEP elated EEI with the successful completion of its "clean coal" John Turk, Jr. Power Plant. The 600 MW $1.7 billion facility is no small investment, but this dividend stock expects it to pay dividends in the coming years. With its "advanced ultra-supercritical steam cycle technology" (an award-attracting name if I've ever heard one), the facility will squeeze more power (39% efficiency) out of low-sulfur coal to keep carbon emissions to a minimum. While the technology itself is impressive, EEI's notes on the finalist hint that regulatory battles may have been the real win for this utility. The Institute's press release notes that "AEP successfully navigated seven years of construction, scheduling, and legal and regulatory challenges by utilizing innovative project management techniques and effective communication, negotiation, and advocacy to finish the new power plant." Balancing old energy with new, EEI's other publicly traded finalist is NextEra Energy , the nation's largest producer of renewable energy. The institute gave kudos to NextEra for its 1,500 MW of new wind commissions in the past year, a move that is contributing substantially to wind power's increasing production. The utility operates more than 100 wind facilities across the country and is constantly looking to increase efficiency through economies of scale and technological advancements. When General Electric announced two weeks ago that it had created the largest, most efficient wind turbine to date, NextEra ordered up 59 for its newest farm. 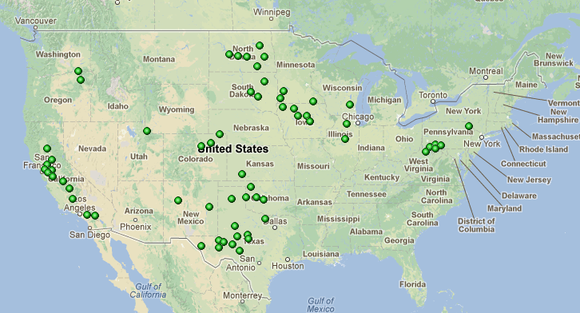 Source: nexteraenergyresources.com; NextEra wind farms. Although the dividend stock now has more than 10,000 MW in wind commissions, it's balancing its renewables portfolio with nuclear generation. EEI also applauded NextEra for the successful completion of a multiyear, multisite, multibillion-dollar uprate project. The modernization efforts added 500 MW to NextEra's nuclear capacity, exceeding expectations by 25%. The uprates equate to an 8.5% increase in nuclear capacity, or a 1.2% increase in NextEra's overall 42,000 MW portfolio. Dividend stocks have been on a tear for most of 2013, with the Dow Jones U.S. Utilities Index hitting 18% gains at the start of May. But as worries over overvaluation have crept into the sector, gains have headed down this month. 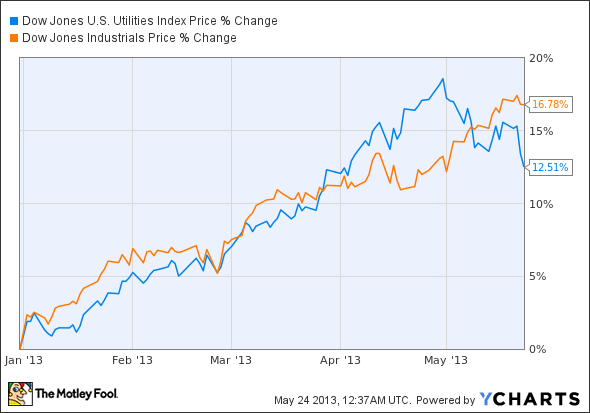 While the Dow Jones Industrial Average is currently clocking 16.8% gains for 2013, utilities are reduced to a 12.5% rise. 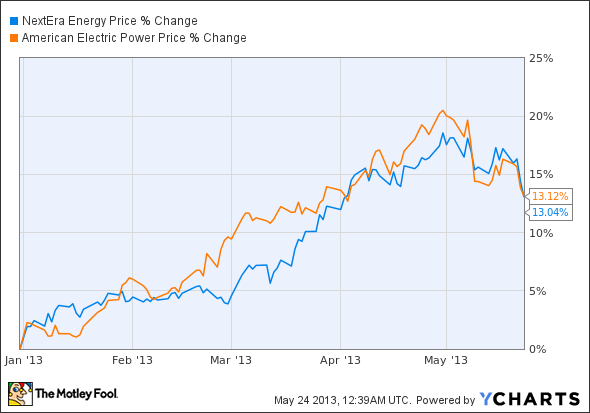 And although AEP and NextEra are hovering above other utilities, their shares also took a dip this month. Awards aren't going to guarantee earnings overnight, but EEI's finalists point to fundamentals that any individual investor should seek out in their dividend stock picks. Leadership, innovation, and progress point to underpinnings of potentially exceptional companies, regardless of coal, wind, or nuclear specializations. Investors can ignore the pomp and circumstance, but taking note of EEI's awards is another point for a well-informed portfolio. The article 2 Dividend Stocks Leading Their Sector originally appeared on Fool.com. Fool contributor Justin Loiseau owns shares of General Electric and once won a third grade spelling bee award for spelling "bachelor" correctly. You can follow him on Twitter @TMFJLo and on Motley Fool CAPS @TMFJLoThe Motley Fool owns shares of General Electric. Try any of our Foolish newsletter services free for 30 days. We Fools may not all hold the same opinions, but we all believe that considering a diverse range of insights makes us better investors. The Motley Fool has a disclosure policy.